The topic of human rights is fast becoming a core subject on many LLB courses and is an essential field of study for all intending lawyers. The Human Rights Act 1998 has now been fully in force for several years and has an extremely significant effect on this subject. As such, this new edition has been thoroughly rewritten and updated to take account of the consequences of the Act, as well as incorporating many new cases and statutes that have arisen since the publication of the last edition. The topics chosen reflect those generally found on human rights and civil liberties courses. 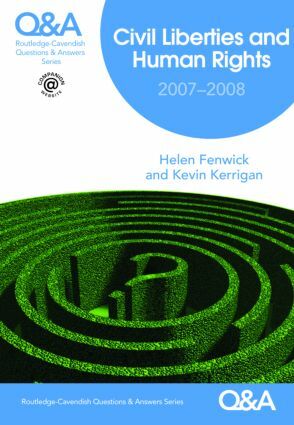 Human rights, perhaps more than any other subject, is rapidly developing and this book concentrates on those areas which are of particular interest at the present time, whilst alerting the student to potential and likely future developments and areas of challenge. Notes in the answers allow the student to develop certain lines of argument further, in line with particular interests or studies. Although primarily aimed at undergraduate students, postgraduate students will also find it of value.